While investigating and scanning an uncharted planet, the Enterprise and its quadrant of space are subjected to a violent force that seems to cause a 'blinking out' of everything near them. The crew goes to the planet's surface and encounters Lazarus, a reality jumping madman. "The Alternative Factor" is episode #27, production #20, and was broadcast on March 30, 1967. The episode was written by Don Ingalls, and directed by Gerd Oswald. This is the first Star Trek episode to deal with a parallel universe. Reviews of the episode here and here. The general consensus is that even though the story has a compelling concept, it was lost in the execution. Forget space hippies, space nazis, space gangsters, and "brain and brain what is brain". This is the single worst episode of Star Trek. Those other have at least some entertainment value, if only as 'camp'. "The Alternative Factor" was and is dull, grim, and incomprehensible. Extra! Universe Winks Out! Boffins Predict Antimatter Invasion! Extra! Rip Appears In Universe! Starfleet in Retreat! Dilithium Crystals Stolen! Commodore Barstow: "You're on your own. Good Luck." Lazarus: "He is death! Anti-life! He lives to destroy!" Spock: "It means the end of everything." Lazarus: "Kill! Kill! Kill! Kill! Kill! Kill!" Kirk: "But what of Lazarus?" I thought Lazarus had strikingly lovely eyes, and the fabric they found for his costume had a really nice weathered shimmer. And it was nice to see a black woman with natural hair. But, yeah, what a lousy episode. QFT. "Spock's Brain" is often considered the worst, but it's miles ahead of this one. No redeeming value at all. If you want to see more of Robert Brown's eyes (without the crazy changeable facial hair) check out the late 1960s series Here Come The Brides. I believe it was his only star turn. Mark Lenard: Yup. The only actor to play three different species on Star Trek* (Spock's father, Romulan commander, Klingon captain in the first film) also played the 'heavy' on Here Come The Brides. David Soul: Who appeared in the 2nd season Trek ep "The Apple" and later played either Husky or Starch -- I never remember which is which -- on a show starring a Ford Grand Latrino with sideburns. Bobby Sherman: More of a singer than actor, he suffers from a stutter in the series. No connection to Star Trek. Joan Blondell! No connection to Star Trek. Inspired by the movie Seven Brides for Seven Brothers. . . . smooth-talking, charismatic logging company boss Jason Bolt (Robert Brown) is faced with a shutdown of his operation as lonely lumberjacks are ready to leave Seattle due to the lack of female companionship. He promises to find 100 marriageable ladies willing to come to the frontier town and stay for a full year. Sawmill owner Aaron Stempel (Lenard) puts up much of the expense money as a wager that Bolt won't succeed, with the three Bolt brothers betting their mountain (home to their logging company). Bolt travels to New Bedford, Massachusetts to recruit the women . . . local saloon owner, Lottie (Blondell) takes the women under her wing and becomes a mother figure to them, while Bolt tries to keep the women from leaving. . . .
Much of the dramatic and comedic tension in the first season revolved around Stempel's efforts to sabotage the deal . . . So: a sort of post-western with peace-and-love themes, starring three actors with connections to Star Trek. *Unless you count James Doohan's many voice characterizations. Mark Lenard being on 7 Brides for 7 Brothers also led to one of the good old ST Pocket Novels - "Call Me Ishmael", in which Spock ends up somehow time-traveled back to the town of 7Bf7B. Been a while since I read it, I think there was some amnesia involved, but I remember it being one of the good ones. 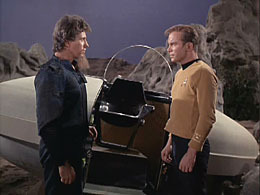 I think a lot of TOS fanfic writers got into 7Bf7B back in the day, I'm sure the Trek connection was what got me watching the reruns, though crush-wise I was into Bobby Sherman. Will have to give it another look know that I'm not a teenager anymore.
. . . and if you dug Laz's costume, this guy is wearing it in "Journey to Babel". Here's another reviewer who agrees that "The Alternative Factor" is the nadir of Star Trek. On a scale of 0 - 10 (he actually awards no 10s), of 79 episodes only "The Omega Glory" and "The Alternative Factor" rate a "0". "The Alternative Factor" is the by far worst episode the franchise ever made. It takes us into a parallel Star Trek universe that is governed by anti-logic. An incoherent plot with an awkward amalgamation of concepts to start with (rip in space, invasion alert, doppelganger confusion, time travel, antimatter universe) . . . abysmally bad screenplay and execution add insult to injury. . . . The only redeeming value of this episode is that several scenes were shot at Vasquez Rocks. By way of comparison, he awards "The Way to Eden" a "2". As to "Spock's Brain", although it rates a "1", on his Best of Trek / Worst of Trek page he places it above "The Apple", "Patterns of Force", "Catspaw", "And the Children Shall Lead", "The Savage Curtain", and "Mudd's Women". This episode, along with Spock's Brain (which I still rate as the worst) are the one's I used to cite whenever a dedicated TOS fanatic would point out how terrible any of the new Star Trek episodes were (and of course there were some terrible one's in each of the new franchises, particularly in Voyager). Also, Mark Lenard played General Urko in the short lived, unfathomably, but typically 1970s, formulaic Planet of the Apes television series. 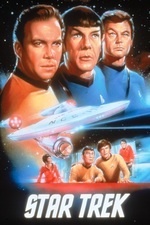 Admittedly, I first saw this when I was a small child, but I have a lingering fondness for it that I do not have for Spock's Brain, Mudd's Women, I Mudd, or the Tombstone shoot-out one (all of which I would rate lower than this one). Maybe child me just liked Lazarus' little pod. One wonders how much better this ep would have been if Drew Barrymore's dad hadn't skipped town the week of shooting (he was cast to play Lazarus).